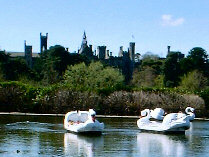 It has been reported by the BBC today that the Swan Boats, long having been an attraction at Alton Towers, are to close before the start of the 2004 open season. It had been rumoured on the internet but nobody was sure whether it was going to happen. A park spokesperson said the park "had to listen to the public's demands", and that they had carried out a survey to find out what the public wanted. It is most likely the Swan Boats are to be replaced by some new Aqua Karts, which have already been applied for.